CWT59 - Thunderhammer Tankard in Gifts is made for Women and Men and comes in Pewter and is made of Glass Pewter material. It is marked as Glassware and weighs about 1.00 lb. A Viking warriors most treasured amulet, Mjolnir, the Norse god Thors mighty weapon of utter destruction. And upon the traditional Celtic knotwork strapping, the inscribed runes translate to May Thor protect this hammer and charge it with the power of the thunder storm. Perhaps it means the beer? 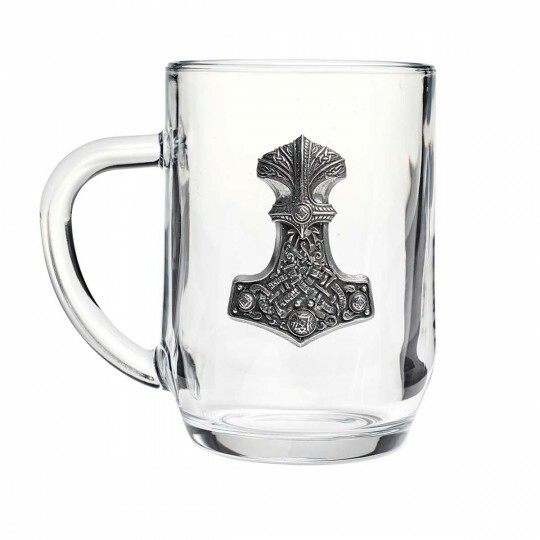 A one pint glass mug with handle, and a large, antiqued pewter 3D modelled Viking Thors hammer decorated with carved, authentically traditional knotwork.